The controls of this system are grouped together on stalk A. 1. 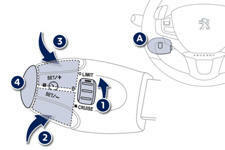 Speed limiter mode selection thumb wheel. 4. Speed limiter on / off button.